Saw this on Houston Midtown's Facebook page. Is it really that difficult to bury the power lines? I would think being in a part of the country that has strong thunderstorms and hurricanes you would want as many buried lines as possible. I do like what they have done on Bagby, this appears to be the same. One day all of the streets in Midtown will be like this and that is great! It is extremely expensive to bury power lines, especially on existing streets. Some streets do have buried high voltage lines, there's one that runs down LaBranch, 140,000 volts, I think. When the substation at LaBranch and Tuam was connected, they had to freeze the lines to keep the insulating oil from running out while they made the tap. Wow did anyone notice the HCC master plan. 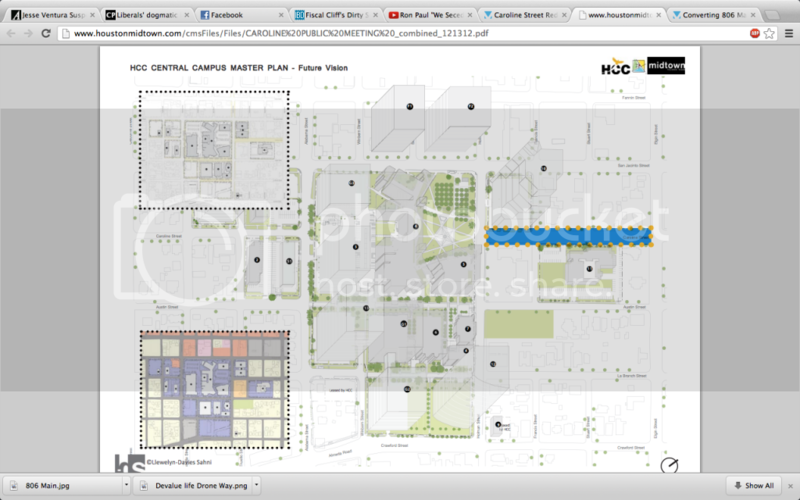 Is that the HCC MasterPlan or a plan created by the Midtown district? Did HCC ever propose mid-rise towers along San Jacinto or was this visualization just for streetscape rendering? Those high rises caught my eye as well. I remember seeing the HCC proposal for upgrade, I dont recall any high rise construction associated with it. Yes, HCC has mentioned one tower in the past. I went to a community meeting they had (maybe two years ago) and they said they were hoping to one day have a tower across the street with something like a big Barnes and Noble on the bottom. Wow, I didn't notice all those. Do we know if they even own those lots yet? So Caroline is the Champs-Élysées and the San Jacinto building is the Arc de Triomphe? Someone needs to tell the Caroline street drug dealers to start hawking souvenirs and offering to take your photo. Urban planners always swing for the fences, but they might get close on this one given the complete lack of anything on this street. It does look like a great plan, here's to hoping for some success. Has anyone heard anything about this lately? The Midtown TRIZ budget shows construction starting soon and there have been utility workers marking sidewalks with paint. Wasn't sure if it was coincidence or if the ball will finally start rolling. Construction on the Caroline Street project is scheduled to start in December 2014. M e h. Not enough Audis. So, is this going to be similar to the Bagby re-do? Caroline in the midtown is looking like Caroline in the museum district. Midtown TIRZ FTW! Makes Montrose TIRZ looks like a pile of incomptent/corrupt crap. From what I can tell, this project is very similar to the Bagby redesign (new sidewalks/landscaping, rain gardens, and bike lanes). I think the goal is spur development on the southern side of Main, since it's definitely lacking at this point. Hopefully will spur some development. Start date, 7 months from now. HOw long did the bagby rebuild take. 1.5 years? "...In addition to green space improvements, the district reported on upcoming construction work slated for Caroline Street. The Midtown Redevelopment Authority is funding the $9 million project with help from a $4 million Texas Department of Transportation grant. The work will include complete roadway reconstruction with new concrete pavement and public utility upgrades along Caroline from Pierce to Holman streets. There will also be sidewalk improvements including new landscaping and a designated bike lane. Large, an avid cyclist, said the proposed bike path will be marked with green paint and will be the first such bike route in Houston. Marshall said the project is set to be put out for bid in December or January with construction to follow later next year." Thanks for the update. It looks like the construction start date is still moving to the right. Roadway improvements, enhancement projects and a bridge replacement were among the construction projects recently approved at last month’s Texas Transportation Commission meeting. ….. Additionally, a joint project with the Midtown Management District to reconstruct Caroline Street from Holman to Pierce Street in the midtown section of Houston was awarded. The pavement on the existing street is in poor condition, and the project will reconstruct the entire street replacing the old pavement with new concrete pavement. The project will also provide new amenities such as wider sidewalks, landscaping, upgraded drainage, decorative lighting and a “rain garden” filtration system. The bridge replacement I believe is the one on Yale that's been discussed for awhile. As for Caroline Street, I'm glad they finally have been given the green light. This area is changing so fast it's amazing. I didn't want to start a new thread for this but what's going on at Sheppard? They have down to one lane in each direction and a few weeks ago I saw them burying massive, like 8ft diameter sanitary/waste water piping in. Is the first of the Rebuild Houston campaigns work?? Big surprise! But $4 million over?! Egads! Methinks the MRA has a solid need to get someone on the board that actually is in construction. $4 million over is so high that the people in charge ought to be shelved! That was actually a more embarrassing part of the meeting. Apparently they bid the project, didn't like the price so they sent it out for rebid... which ended up EVEN HIGHER than the original. Midtown Rep: "Caroline Street: You guys may be aware from the Chronicle article we received we're working with TxDOT on this project, a joint project between the Redevelopment Authority and TxDOT. TxDOT has a $4 million grant attached to the project, and they are also responsible for bidding and construction management of that project. "That project was re-bid, in January, in hopes of getting better bids. In all actuality, the project, the bids came back higher, than the initial bid. Came back at 13.9. Our engineer's estimate was right at 10.8, so this is about a $3 million gap. So in that, we had some, hard questions to answer. "And just the details of that project: It's a complete reconstruction of the roadway as well as back-of-curb improvements, very similar to the treatment that Bagby Street received. Not the exact level of those treatments, maybe a slight level below, but a lot of the amenities will be similar and it will run from Pierce to Elgin Street. "And there's also a second phase that we're working on with Houston Community College to improve the blocks between Elgin and Holman Street at a later date." Apparently this project was pared down are re-bid but still came in over budget. I think they're planning to put this (and other proposed projects) on the back burner until some of the current construction boom slows down a bit. Probably smart, but the city just needs to realize that these complete street improvements aren't exactly going to be cheap and should anticipate that they will cost a little bit more than just laying down a new road with a simple grass median and 4-5' wide sidewalks. The simple fact is....they are probably being a little cheap and don't want to pay a lot for it. You are correct. I was told that the city is not willing to support MRA on much other than sidewalk improvements because it is their opinion that the tax increment is technically their contribution... I can see how they would think a portion of that lost revenue is theirs (especially with the renewal of the TIRZ for another 10 years), but I think they are being a little short-sighted with how much an area can improve after an upgrade like was done on Bagby. The result of this project is going to be right in line with their Houston Tomorrow initiatives. Holman Street improvements are under construction at this time (not Caroline). If we want to make a separate thread, that works or we can keep it here. Vibrant streetscape enhancements to Holman Street will deliver a safer connection for pedestrians from the light rail line to HCC and the nearby culture, entertainment and night life venues. Holman Street is a major roadway for access to the main campus of Houston Community College and to the METRORail station and other nearby transit services. Holman Street distinguishes itself from other streets within Midtown by featuring streetscape that builds on connections to the light rail line and other nearby amenities, and sets a precedent for future streetscape redevelopments within the community. With the improvement of Holman Street also comes private development including Mid Main projects such as apartments, restaurants, retail shops and parking, and the Midtown Arts & Theater Center Houston (MATCH), which will serve as a venue for various exhibits and performances. The new structure, located at 3400 Main St., will include a main theater, three black-box theaters, two small performance areas, a large gallery space, office space and a coffee and wine bar. The Main Street Enhancement Project focuses on safety, aesthetics, environmental considerations and connectivity. Residents, business owners, visitors and tourists will benefit from the upgrades made to area, which is an important site for transit between NRG Stadium and downtown. More lighting and widened sidewalks are just a couple of enhancements on this project. From an aesthetics standpoint, new landscaping and street furniture will accentuate the modern look and feel of the area, encouraging merchants to set up businesses in the area, and welcoming residents to look to Midtown for their new home. The project will also encourage nearby private development. 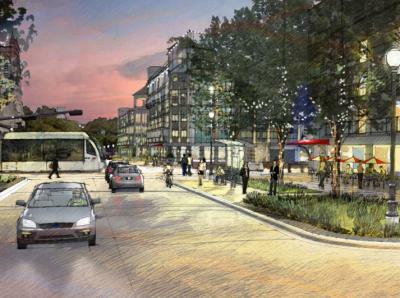 Will this include street lights that actually light up the sidewalk? I've always felt like Midtown Main Street feels different than the Midtown everyone else talks about. Main Street: "Wow, this feels kind of run-down, even if it is improving." Louisiana: "So this is the Midtown I've heard about. Looks nice and modern, but that's yuppieville for you." Yeah MidMain in the rendering could use better lighting and more places to go. I still enjoy going to Double Trouble, Alley Cat, and Continental Club. That little area by the continental club is such an anomaly for midtown. I wonder how long this little pocket can hold out being weird before they are squeezed out? All of midtown needs lighting like they have on Dallas street. There are so many pedestrians, they need more light than they have. It's what makes this part of Midtown cool, the rest of Midtown is just a continuation of the douchebag Affliction/Ed Hardy wearing frat bars that line Washington Ave.
Did they happen to say the time-frame on this project? Lots of orange work stuff on Main Street near Alabama. They covered up most of the trees with wood, so it appears something big is about happen. I'd guess that this is finally underway. The trees are covered all the way down to the Superblock and they've started pouring new sidewalks along Main on the southern stretch of the project. Saw new tree lighting in place while zooming by on the rail. Also portions of the new sidewalks are not wide enough imo. The narrower parts that I've seen appear to have room on both side of the sidewalk for pavers. Should put the total width around 6ft or more. Contractor trailers are in place in the lot across from Weight & Measures. I talked to one of the workers and he said this project will kick off in the next month or so. Work will start on the HCC end of Caroline and progress toward Pierce. Midtown is becoming a very cool neighborhood!